This holiday season and beyond, Hendrick's Gin is sending Canadian urbanites flying in a most unusual way with the launch of an urban take on the classic hot air balloon. Prominent elevators in select major cities across Canada will be attired in Hendrick's inspired vintage décor, giving riders the impression of a Jules Verne-esque hot air balloon ride to the heights of the city. Hendrick's will transform an otherwise ordinary ride into an uplifting, scenic, view into the delightful world of Hendrick's Gin. For urban dwellers who prefer to keep their feet on the ground, Hendrick's Gin has festively decked out Toronto's city streetcars in Victorian themed décor to ferry Torontonians and city visitors throughout the city on their holiday errands. 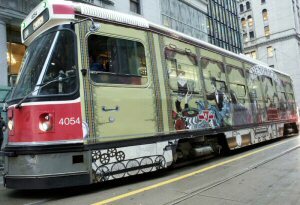 Dickens-inspired wrapped streetcars patterned after Victorian-era trains can be spotted in downtown Toronto from December until mid-February 2014. Toronto's 501 Queen line, the longest streetcar route operating in North America and one of the longest streetcar routes in the world, will have its iconic double length car dressed to delight and inspire the downtown core. The double car will also be riding the 504 King route. Single wrapped cars can be spotted on any of the other nine routes around the city. Hendrick's is a deliciously premium gin, made with a number of unusual twists to deliver a most curious arrangement. Unlike ordinary gins, Hendrick's is distilled in Scotland. Only Hendrick's is made with infusions of Cucumber and Rose petals, producing a wonderfully refreshing gin with a delightfully floral aroma. Hendrick's is the only gin made in a combination of a Carter-Head and copper pot still, creating a divinely smooth gin with both character and balance of subtle flavours. Hendrick's is handcrafted in miniscule batches of only 450 litres at a time. To view the photo associated with this press release, please visit the following link: http://www.marketwire.com/library/20131211-Hendricks800.jpg. 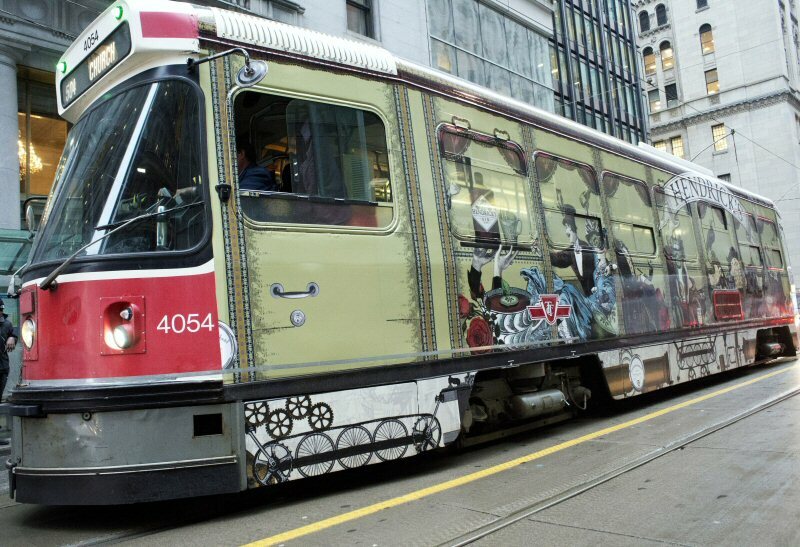 Hendrick's Gin Dickens-inspired wrapped TTC streetcars are patterned after Victorian-era trains.